A few years ago it was still common practice that almost every yacht was equipped with a lot of steel fittings and wire rope on every nook and corner. Modern rigging innovations can replace all types of hardware on-board, such as running rigging and traditional shackles. Why is that? The reason for this is simple: Rope is lighter than stainless steel or wire and it also has a higher breaking load in some cases. This is especially true for racing and regatta vessels, which become noticeably faster due to the significant amount of weight saved by using rope-based rigging on-board. A basic maritime rule is that each additional kilogram of rigging must be compensated by about seven kilograms of extra ballast, in order to keep the vessel sturdy. Discover our range of Dyneema rigging! In addition to properly trimmed rigging, a massive performance-booster for your yacht and its running rigging is determined by the: angle, twist and tension the sails. The lower stretch that sheets, halyards and control lines have, the better and more constant the tension of halyards can be maintained, making it less necessary to reposition your halyards, even if the wind speed increases. The more the running rigging stretches, the higher the probability that important tension on the sail can be lost in increasing winds and that your sail becomes untrimmed and bulbous during gusts of wind. In sailing terminology, "bulbous" is defined as a sail with an extremely curved profile, which produces very little propulsion and lots of resistance. This should be especially avoided in windy conditions, where the sail should be trimmed flat, because it provides less resistance. Which Dyneema rope is right for my boat? Since the invention of Dyneema high-performance rigging, the Dutch company DSM has optimized and changed their fibers several times. The first fiber type was designated as SK 60. The next types were then called: SK 75, 76, 78, 90, 95 and 99. SVB offers Dyneema rigging from the Gleistein brand, based in Bremen, Germany. 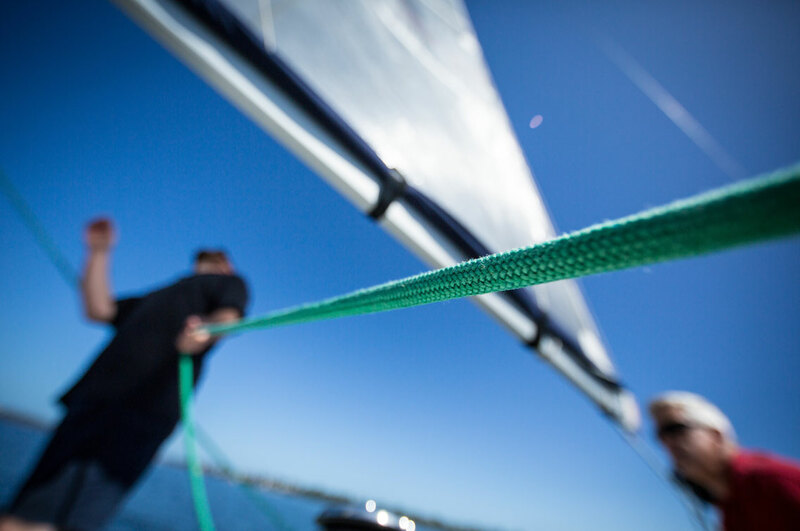 For use on yachts, braided rigging is almost exclusively used, usually with a core-sheath braid, wherein the core takes the burden of the tensile forces and the outer sheath protects the core. We offer both rigging made out of pure, coated Dyneema fiber, such as Gleistein´s DYNA ONE and rigging with a Dyneema core and polyester sheath. The Dyneema core reduces stretching on sheets and the sheathing around the Dyneema core ensures that the rigging is held secure on winches, cleats and stoppers. This way, the sheath doesn’t have to bear the load. The specific type of design and braiding is of the most importance in assuring a quality core. Normally, a twelve- or sixteen-fold braid is used for the core. In the case of twelve-fold braiding, individual braids tend to move in the direction of the load, whereas in the case of sixteen-fold braiding - the individual braids entwine less and are contained to a higher degree, considering the given length and thickness of the core fiber material, which reduces the stretching of sheets. Regatta sailing is a high-performance sport, in which sailors require great stamina, experience and performance. On top of teamwork, the best materials and rigging are also essential. As a regatta sailor, you naturally need running rigging with minimal stretch and the lowest possible top weight. A low degree of stretching is ensured by Dyneema’s fiber core. The outer sheath should also provide the best possible grip in the fittings as well. In order to save even more weight, we offer our regatta sailors with the TAPERTWIN, by Gleistein. This type of rigging has been specially produced for regatta and racing yachts with its sheathed, 12x core design and thus provides an ideal rigging solution when it comes to saving even more weight on-board. It is perfect for use with halyards and sheets – as the mainsail, jib, gennaker and spinnaker. Another top seller for regatta and racing yachts is our top class rigging solution, DYNA ONE, by Gleistein. This type of rigging is constructed out of pure Dyneema 12x braid, with a special coating and without a sheath. DYNA ONE provides the strength and breaking load of a wire rope at one-eighth the size. Especially when used as a control, trim or steering line, it comes as a great advantage aboard racing and regatta yachts. By not having a sheath, not only is a lot of unnecessary weight spared, but it also runs smoother through blocks and diversions as well. If you’re a cruising or offshore sailor and you sail for several days or even weeks at a time in high winds and rough seas, the demands on your running rigging increase. Your halyards and sheets must be able to bear extreme loads, due to the fact that your washers, stoppers and winches may cause abrasion and the long-term expansion of your running rigging may also cause increased wear. Here we advise you to use halyards and sheets with pure Dyneema core with 12-braids, such as CRUISE XP, developed by Gleistein. This type of rigging guarantees sufficient tension on your halyards over a longer period of time and they are available in different colors and levels of thicknesses, which also offer the end-user with an optimal price to performance ratio as well. Finding out which type of Dyneema rigging suits you and your yacht the best is decided by your sailing habits. For weekend and recreational sailors, the classic „CUP“ or "HARKON" or rigging solutions without Dyneema fiber can be used, since this type of sailing doesn’t require expensive or high-performance rigging.